The main scribes of this Psalter have been identified in other manuscripts made for Leofric, bishop of Exeter from 1046 to 1072. Like those manuscripts, this one was probably given by him to the cathedral. 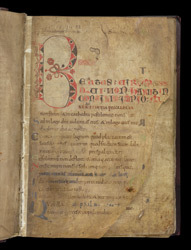 The 11th-centry scribe left a large space for the Beatus initial and opening words of the first psalm, but this was left blank until the 12th century, when the red and brown letters were supplied.